Each fall, college football stadiums come alive with action and excitement. Fans pack into college football stadiums to show their school spirit, with the largest stadiums offering a visceral experience to thousands of like-minded onlookers. Some college stadiums provide elaborate VIP seating and fancy cuisine, while others offer good old-fashioned bleachers and popcorn. Stadiums with high-tech sound systems and jumbotrons provide entertainment beyond the game itself. Additionally, many stadiums have a rich history and decades-old traditions. 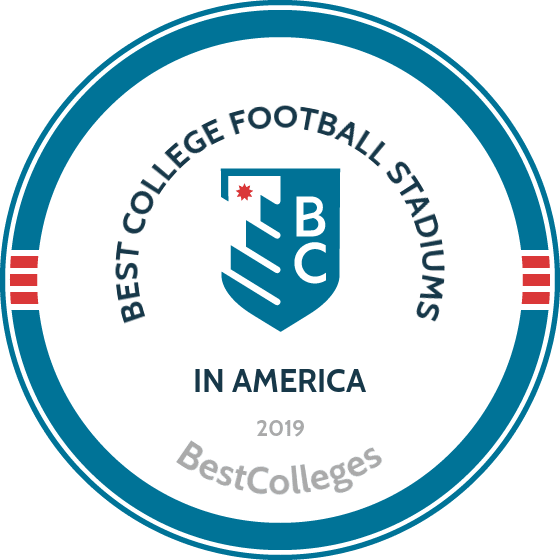 The best-known and most cherished college football stadiums blend technical innovation, university tradition, and school pride. While the atmosphere at a college football game may transcend potential perks, the best stadiums give athletes and spectators an experience they will never forget. Louisiana State University in Baton Rouge hosts football games at Tiger Stadium, a facility that can accommodate more than 100,000 people. Nicknamed Death Valley, Tiger Stadium gives LSU a strong home-team advantage. LSU broke ground on the initial stadium in 1926, with 12,000 seats available to spectators. Over the decades, Tiger Stadium grew, with the most recent addition completed in 2012. Game day at Tiger Stadium features tailgating, access to the facility's many suites and large student section, and the chance to watch the game from The Chute, a lounge area with food, alcohol, and high-definition screens to keep track of the action. Night games at Tiger Stadium give spectators an under-the-lights experience before and during the game. Students tailgate in Tiger Village, watch the LSU marching band and football team descend Victory Hill, and visit Mike the Tiger across the street before entering the north end zone two hours and 45 minutes before the game. Students then stake their claim in one of the most intimidating student sections in all of college football. The UCLA Bruins play football at the Rose Bowl, a facility that has hosted the Olympic Games, several Super Bowls, and multiple World Cup tournaments. The Rose Bowl Stadium was built in 1916 to accommodate 57,000 spectators. Over the years, the stadium has grown to seat more than 90,000. The first college football games played at the Stadium pitted the University of Southern California against Penn State in 1923, but the Rose Bowl became the official home of the Bruins in 1982. Historic Rose Bowl Stadium, with its horseshoe shape and classic pillars, evokes a feeling of awe. Spectators can enjoy the Rose Bowl's club seats, suites, or Loge Lounge. Others sit in the sun-baked student section. Regardless of seating, spectators decked out in Bruin blue and gold participate in traditions like singing the school's alma mater, "Hail to the Hills of Westwood," and ringing the Victory Bell after a win over rival USC. Ohio Stadium at The Ohio State University in Columbus seats more than 102,000 people. Completed in 1922, the original horseshoe-shaped stadium accommodated about 66,000 spectators. The stadium was initially thought to be too big, but the more than 70,000 individuals who turned out for the facility's dedication proved otherwise. Over the years, the stadium has undergone several renovations and expansions. Ohio Stadium features Roman-style architecture and currently offers premium seating and loge boxes. The terracotta tiles in Ohio Stadium's dome entryway add to the grand feel of the facility, now on the National Register of Historic Places. Students and spectators at OSU football games, known as the "Best Fans in the Land," enjoy tailgating outside Ohio Stadium in a sea of scarlet and gray. During the game, OSU traditions like singing "Carmen Ohio" foster Buckeye pride and contribute to the overall atmosphere. The student section, comprising members of Block O, provides cheers, yells, and card stunts during games. Husky Stadium at the University of Washington in Seattle only houses 70,000 fans, but what the stadium lacks in size, it makes up in atmosphere. The views from Husky Stadium feature Seattle's skyline and the Olympic and Cascade mountain ranges, giving spectators a scenic backdrop to game day. Built in 1920, Husky Stadium underwent renovations during the 1950s and 1980s and again in 2012. Located near Union Bay on Lake Washington, most of Husky Stadium's seating is located between end zones, creating a sound tunnel that opponents struggle to manage. With its waterfront location, fans can tailgate on land or by boat before a big game. Members of UW's Tyee and Big W clubs have access to premium seating. Dawg Pack members in the student section chant "Go Huskies" and explode with excitement every time they hear the air raid siren that indicates a UW score. Completed in 1923, Memorial Stadium at the University of Nebraska, Lincoln underwent a massive upgrade in 2017, after which the facility accommodates 90,000 spectators more comfortably. Memorial Stadium features inscriptions at the four corners of its foundation. The words honor fallen war heroes and have remained during the facility's long history. Recent changes to Memorial Stadium did not lessen the importance of the Cornhuskers' Tunnel Walk at the beginning of games, which is accompanied by "Sirius" by The Alan Parsons Project. Before the tunnel walk, the entire stadium participates in the pre-walk call-and-response chant of "Husker Power." The student section at Memorial Stadium, also known as the "Boneyard," constitutes 10% of the stadium's capacity. During the game, every student in the Boneyard takes off one shoe and jumps up and down for kickoff. They also throw crossbones with their arms when Nebraska's defense takes the field or makes an important stop. Largely comprising members of The Iron N, the Boneyard contributes heavily to Nebraska's loyal "Sea of Red." Ben Hill Griffin Stadium, initially called Florida Field, is located in Gainesville and held more than 21,000 spectators when constructed in 1930. Today, the University of Florida football stadium, better known as "The Swamp," holds more than 88,000 fans and features luxury boxes and state-of-the-art screens at both end zones. Fans at The Swamp link arms and sing "We are the Boys" between the third and fourth quarters of football games. Mr. Two Bits has inspired fans to "holler" for the Gators since 1949. During the game, fans also shout a variety of cheers, including "Orange Blue Let's Go" and "Gator Country," and the Rowdy Reptiles practice their Gator chomp. Game day at Ben Hill Griffin Stadium includes tailgating, the BUBBA Burger Fan Fest, and the Gator walk during which fans cheer the UF football team as they enter the stadium. Spectators can also enjoy a variety of concessions during the game, including a gator bait sandwich or a swamp dog. Clemson University in South Carolina holds home football games at Memorial Stadium, a facility that opened in 1942. Nicknamed "Death Valley" due to its initial proximity to a cemetery, Memorial Stadium currently holds more than 80,000 spectators. Fans can enjoy tailgating before games and can watch the Tigers play from one of the seats in Memorial Stadium's enormous upper decks. During the opening of each football game, Clemson's team runs down The Hill from Fike Field House onto the field, an event called the most exciting 25 seconds in college football. Prior to making the trek down The Hill, players rub Howard's Rock, a rock from Death Valley gifted to former Clemson coach Frank Howard. The tradition began in 1966. While the balloon release that accompanied the run down The Hill recently ended, the strength of the school's Central Spirit student organization keeps other traditions alive. During games, members of Central Spirit paint themselves orange, yell, and take part in the alma mater salute with alums. The https://www.fsu.edu/ Seminoles play football games at Doak Campbell Stadium in Tallahassee. Fans celebrate on Friday night with a block party, and on game day they tailgate outside Doak Campbell Stadium. Before the start of the game, Seminole warrior Osceola rides down Bobby Dowd Field in Doak Campbell Stadium on Renegade, his Appaloosa, and the crowd roars with excitement. During the game, the Seminole war chant echoes through the stadium as spectators move their arms as though brandishing a tomahawk. Built in 1950 and since expanded to hold more than 80,000 spectators, Doak Campbell Stadium hosts students in its northeast sections, near skyboxes and the Champions Club. Doak Campbell Stadium also features a scoreboard more than 60 feet tall. Home of the Aggies, Texas A&M University in College Station hosts football games at Kyle Field. Thousands of fans attend Midnight Yell at Kyle Field the night before each game. The tradition of the 12th Man dates back to 1922 when Coach Dana Bible brought E. King Gill, a squad player up in the stands, down to the sideline. Gill's willingness to play and his dedication to the team has inspirited the entire student section at Kyle Field, the 12th Man, to stand throughout games ever since. The 12th Man holds 31,000 student spectators. Before Aggie football games, fans tailgate in the area around Kyle Field. While the Aggies play, yell leaders, not cheerleaders, inspire the crowds. During games, marooned-out crowds of more than 102,000 fans sing "The Aggie War Hymn." Penn State offers a stadium experience that begins days before the big game. Beaver Stadium, which seats more than 105,000, no longer hosts the pregame pep rally on Friday nights, but students set up a tent town known as Nittanyville the week before a home game, to claim the best seats in the student section. Tailgaters and other fans can watch the Nittany Lion football team arrive in blue buses before the game and exchange high fives with the players as they enter the stadium. Penn State's marching band, the Blue Band, spells out "LIONS" on the field before lining up into tunnel formation for the team's entrance. The current Beaver Stadium dwarfs the original structure built in 1960 and offers luxury boxes and club seating. Members of the Student Nittany Lion Club watch games from the student section, participating in the school's famed white outs. The University of Notre Dame's Fighting Irish play home games at Notre Dame Stadium, built in 1930. Notre Dame Stadium has undergone numerous renovations and now holds more than 80,000 spectators. Seats have sold out for almost 250 consecutive games. The Fighting Irish marching band leads fans through campus the night before a game, and tailgating begins during the early hours of the morning. Once the game begins, spectators decked out in blue and gold sing the Notre Dame fight song, the "Notre Dame Victory March." Students watch the game from the lower northwest corner of Notre Dame Stadium, where they have a clear view of the Notre Dame leprechaun running around the field with the Notre Dame flag. Cheers of "Go Irish" begin with kickoff, and students stand during the whole game. Fans even dance a jig when the marching band plays "Rakes of Mallow." Michigan Stadium at the University of Michigan was built into a hillside in Ann Arbor in 1927. The stadium initially held about 85,000 spectators, but the facility was expanded during the late 1940s to accommodate more than 97,000. Michigan Stadium currently holds more than 107,000 fans, making it one of the largest and loudest stadiums in college football. Football gameday at Michigan Stadium, also called "The Big House," starts with Fan Fest, tailgating, and pregame entertainment on the streets surrounding the stadium. The Michigan Marching Band enters the stadium an hour before the game, and the Wolverine football team runs through a blue banner as they take the field. Fans sing the Michigan fight song, "The Victors," during the game. The University of Oregon Ducks play home football games at Autzen Stadium, which seats 54,000 spectators. Completed in 1967, the stadium houses more than thirty luxury boxes and a 10,000-square-foot entertainment center in the Barker Stadium Club. Fans keep track of the action on the MegaVision scoreboard in the south end zone. Game day traditions and activities include tailgating outside the stadium before the game and visiting Ed Moshofsky Sports Center, which provides food and entertainment. During the "march to victory" hours before kickoff, fans high five the Duck football team as they enter the stadium. Once the game starts, fans start throwing the "throwing the O." The University of Oregon marching band plays the Oregon alma mater after every touchdown while The Duck does push ups in celebration of the rising score. Sanford Stadium at the University of Georgia in Athens accommodates almost 93,000 fans. Built in 1926 and renovated several times since, Sanford Stadium is known for its field "between the hedges" thanks to the unique shrubbery surrounding the field. Before the game, fans tailgate and watch the "Dawg Walk" when the Bulldogs football players, the Redcoat Marching Band, and the cheerleaders enter the stadium. Before the game, a lone trumpet player regales the stadium with a moving rendition of "The Battle Hymn of the Republic." During the kickoff and at various times throughout the game, spectators "call the Dawgs," a Bulldogs rally cry students begin practicing as freshmen. Fans may also catch a glimpse of Uga, the English bulldog that serves as the official mascot. After a Bulldogs victory at Sanford Stadium, fans rush to ring the Chapel Bell. Home to the Crimson Tide, football game day at the University of Alabama in Tuscaloosa centers around Bryant-Denny Stadium. When Bryant-Denny Stadium was built in 1929, the facility held 12,000 spectators. After several expansions and renovations, the stadium's capacity now exceeds 101,000. Tailgating before Crimson Tide football games includes family-friendly options and traditional college game day activities. The Walk of Champions before the game features Crimson Tide football players entering the Bryant-Denny Stadium. Students who join the Crimson Chaos, the official student organization for supporting athletics, contribute to the endless sea of red, yell "roll tide roll," and listen as the Million Dollar Band plays songs like "Sweet Home Alabama" by Lynyrd Skynyrd. If Alabama wins, fans sing the "Rammer Jammer," the official victory song of the Crimson Tide. Named for former athletic director and football coach Robert Neyland, Neyland Stadium at the University of Tennessee grew from the modest Shields-Watkins Field built in 1921. Neyland Stadium, dedicated in 1962, now accommodates more than 102,000 spectators. Some fans of the Tennessee Volunteers tailgate on land, while members of the Vol Navy tailgate by boat on the Tennessee River. The pregame Vol Walk features the Volunteer football team and the marching band. Students watch from the northeast corner of Neyland Stadium. When the football team takes the field, they run through the T shape formed by the marching band, a tradition that dates back to the 1960s. During football games, the checkerboard endzones resemble the orange and white in the stands as spectators sing "Rocky Top" and the official University of Tennessee fight song, "Down the Field." University of Wisconsin, Madison football games at Camp Randall Stadium include shouting contests between students in sections O and M as they cheer for the Wisconsin Badgers. Built in 1913, Camp Randall's original wooden bleachers collapsed two years later and were replaced with concrete. The new facility was dedicated in 1917 and grew to accommodate 33,000 over the next decade. After numerous expansions, Camp Randall now holds more than 80,000 fans. On game day, fans tailgate in Badgerville, with brats and beer, before entering the stadium to watch Bucky Badger rile up the crowd. Fans can watch the Wisconsin Band spell out "ON WIS" during halftime or stick around for the Fifth Quarter, a post-game show that thousands attend. When "Jump Around" by House of Pain plays between the third and fourth quarters, students jump and shake the stadium. In 2003, Camp Randall underwent renovations to reinforce its structure to accommodate the massive amount of shaking caused by the tradition. Jordan-Hare Stadium at Auburn University opened in 1939 and currently holds about 88,000 spectators. Pat Dye Field is an intimidating, loud stadium that gives the Auburn Tigers a decided advantage. Events for Tiger home football games center around Jordan-Hare Stadium, beginning with the Tiger Walk during which fans cheer on the football team as they enter the stadium. Before the start of a game, the Auburn eagle takes flight, a symbol of the "War Eagle" Auburn rally call and fight song. The Auburn University Marching Band plays "War Eagle" each time the TIgers score. The entire student section in the southeast corner of Jordan-Hare Stadium sways when "Swag Surfin'" by F.L.Y. plays over the loudspeakers. Students from Auburn's Superfans group paint themselves to show school spirit and cheer along with the official mascot, Aubie the Tiger. Yale University's Yale Bowl opened in 1914 for "The Game" against Harvard. The Yale Bowl encompasses the Class of 1954 field and sits on more than 12 acres in New Haven, Connecticut. When the Yale Bulldogs take the field, they play for more than 61,000 spectators, each with an unobstructed view of the action. Before a game at the Yale Bowl, students and fans participate in tailgating and watch the Bulldog Walk as the team walks with arms linked through campus, accompanied by the Yale Precision Marching Band. When the Yale Bulldog football team emerges from the tunnel onto the field, the marching band plays and the crowd roars. During the game, fans break out into various fight songs, including "Goodnight Harvard," reserved for their Ivy League rival. An additional staple at Yale football games is Handsome Dan, the English Bulldog that has been the school's mascot since 1889. After a Yale victory, the entire football team stands on the sidelines and leads the crowd in the Bulldogs fight song. The Virginia Tech Hokies play home football games at Lane Stadium, built in 1965. Lane Stadium, which houses Worsham Field, sits more than 2,000 feet above sea level and accommodates almost 54,000 fans. The stadium features an innovative grass system, a state-of-the-art video board, outdoor club seating, and luxury boxes. Virginia Tech fires Skipper, the school's cannon located just outside the stadium, before football games and every time the Hokies score. The Hokie football team enters the field to Metallica's "Enter Sandman." While the rock music plays, fans jump up and down to show their excitement. During the game, spectators sing the Hokie fight song, "Tech Triumph," and the school's alma mater before raising their keys and shaking them for any third-down offensive play. The Hokies, sometimes still referred to as the Gobblers, and their HokieBird mascot shout the "Old Hokie" cheer throughout the game. The United States Military Academy, home to the Army football team, provides football fans with a stadium experience steeped in tradition. The Black Knights, often referred to as the Cadets, play at Michie Stadium in West Point, New York. Michie Stadium opened in 1924 and was named to honor Dennis Michie, the man who started Army football at West Point. Located on the banks of the Hudson River, Michie Stadium holds 38,000 fans. On game day at West Point, parking lots open six hours before kickoff. A full-dress parade of cadets fills "The Plain" on campus three hours prior to the game. For the next three hours, Black Knights Alley fills with entertainment and food for fans to enjoy. Right before the game, a 1,000-cadet regiment takes the field, and the Army Band follow a parachute demonstration with the game ball. Once the Army football team takes the field, fans shout the "Rocket Yell" and the "USMA Cheer" and sing West Point's alma mater. Fans also watch the three mule mascots and their riders circle Blaik Field. The University of South Carolina Trojans have played home football games at the Los Angeles Memorial Coliseum since 1923. The Coliseum has also hosted Olympic Games, the UCLA Bruins, Super Bowls, concerts, MLS soccer, and NFL teams. The Coliseum accommodates 75,000 fans, and when USC takes the field, spectators take part in a series of Trojan traditions. Game day for the Trojans at Los Angeles Memorial Coliseum includes the USC Trojan Saukko guiding Traveler, the white horse, around the field. Fans sing fight songs like "Fight On!" played by the Trojan Marching Band. Nicknamed the "Spirit of Troy," the Trojan Marching Band plays halftime shows full of contemporary music. Fans flash the "V for Victory" sign during the game, and yell leaders do push ups in the endzone after each USC score. Folsom Stadium at the University of Colorado, Boulder sits on a hilltop and offers spectacular views of the Rocky Mountains to fans of the school's Buffalo Herd. Dedicated in 1924, Folsom Stadium accommodates almost 54,000 fans, including spectators in the facility's loge boxes and specialty club seating. Before and during the game, fans can visit the Rooftop Terrace and, on a clear day, can see the Continental Divide. Prior to the game, Buffalo football players participate in the Buff Walk along the east side of the stadium, surrounded by cheering fans. On game day, fans can enjoy music and food at Ralphie's Corral near Folsom Stadium. The Golden Buffalo Marching Band plays the CU fight song and provides entertainment throughout the game, and Ralphie, CU's mascot, runs across the field at the beginning of the game and at halftime. Fans of the Baylor Bears tailgate and sailgate outside McLane Stadium at Baylor University thanks to the stadium's proximity to the Brazos River. Built in 1950, McLane Stadium went by the names Baylor Stadium and Floyd Casey Stadium until 2013. Currently, the facility seats about 45,000 fans. The pregame festivities around McLane Stadium include the Bear Walk, when the Baylor Bear football team walks through the tailgating area to the stadium. Soon after, the Baylor University Golden Wave Band follows suit. Lines of fans follow the band into the stadium. Before kickoff, Baylor's student and home sections perform the Baylor Bear chant. During the game, students and fans make a bear claw while yelling "Sic 'em Bears" and do the Whisper Chant. If Baylor wins, everyone stays after the game to sing "That Good Ol' Baylor Line" with the coaches and players. Lavell Edwards Stadium at Brigham Young University offers spectators views of the Rocky Mountains as fans watch the BYU Cougars play. Seating 5,000 when it opened in 1963, the former Cougar Stadium was renamed for BYU football coach Lavell Edwards in 2000. Lavell Edwards stadium sits more than 4,500 feet above sea level and accommodates 65,000 fans, many of whom are painted blue and white on game day. Prior to a game at Lavell Edwards Stadium, the Cougar football team takes part in the Cougar Walk in front of cheering fans, a relatively new addition to the school's football tradition. Pregame celebrations at BYU reach their height during homecoming week, when students douse themselves with True Blue Foam. Before each game of the regular season, the BYU marching band provides pregame and halftime entertainment. Fans, painted or wearing blue tee shirts, sing BYU's fight song, "The Cougar Song," and enjoy antics by Cosmo, BYU's mascot. The college football stadiums with the largest capacities, most elaborate traditions, and deepest histories rank highest on this list. Many older stadiums have undergone upgrades and name changes over the years, but the facilities still provide spectators with a sense of pride, camaraderie, and school spirit. This list includes stadiums with tailgating and facilities with unique video and audio experiences. This list also factors in the quality of food, drink, and seating, which contribute to the overall college football experience.